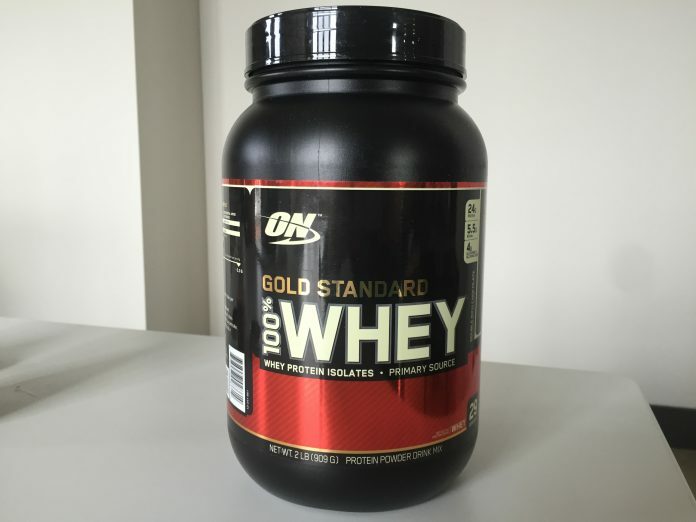 Optimum Nutrition’s Gold Standard needs no introduction. 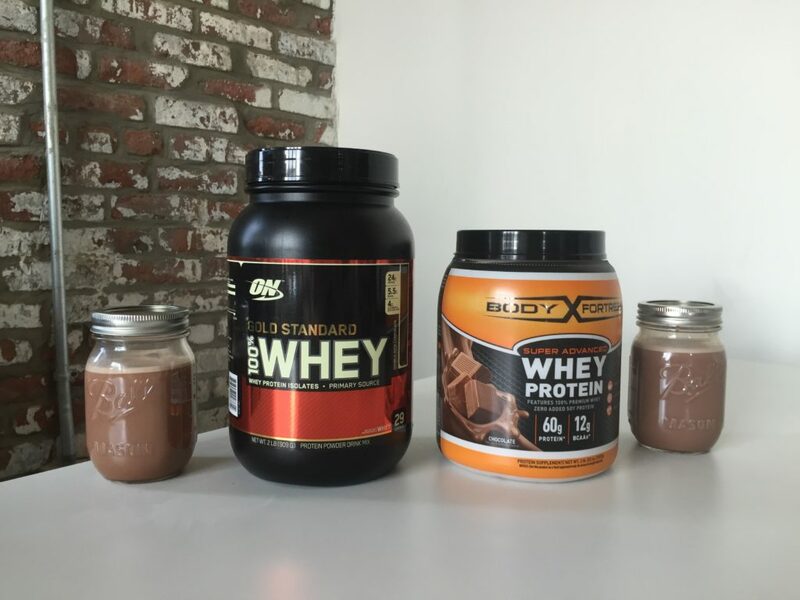 It’s the most popular protein powder on the market, popular among consumers for being high protein, low-carb, low-fat, inexpensive, and having a great reputation with third party quality testers. Body Fortress is a little less well-known. Super Advanced Whey can be found in most Walmarts for a very low price, and it has a lot in common with Gold Standard. They have a similar price and similar ingredients, but big differences in nutrition, ingredients, and taste. They’re both thirty bucks for two pounds, so which one is worth your dollar? One scoop provides 24 grams of protein, 3 grams of carbohydrate, and 1 gram of fat for a total of 120 calories. There’s 10 percent of your daily cholesterol and 5 percent of your daily sodium as well. One scoop has 30 grams of protein, 8 grams of carbs, and 5 grams of fat, for a significantly higher calorie load of 200 calories. 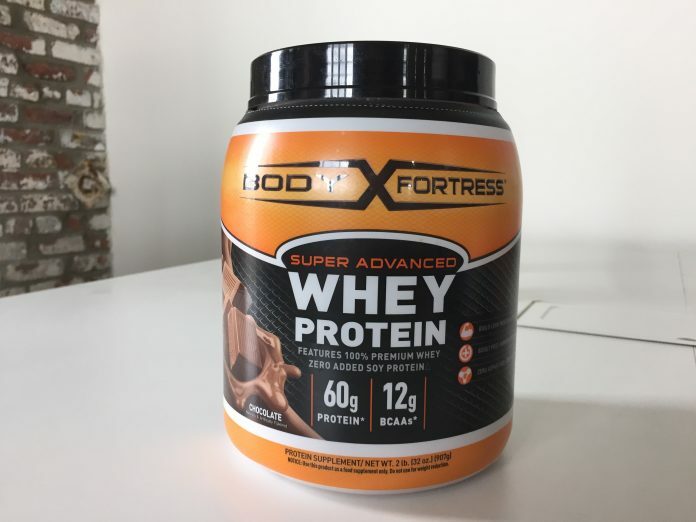 It’s less versatile compared to the low-carb, low-fat Gold Standard; Body Fortress has 25 percent more protein, but more than twice as many carbs and five times more fat. It also has four times as much cholesterol, with 40 percent of the recommended daily intake. Gold Standard has fewer calories, carbs, and fat, making it a more versatile product and our winner in this category. They have a lot in common: both contain soy lecithin for mixability and they both have the same artificial sweeteners, sucralose and acesulfame potassium. 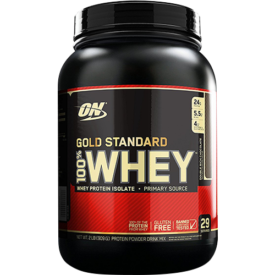 Gold Standard has whey isolate as its first ingredient, followed by whey concentrate and hydrolysed whey. Besides that and the other ingredients I mentioned, it’s just got natural and artificial flavors and the digestive enzymes Aminogen and Lactase, which may help the protein absorb and minimize digestive issues. 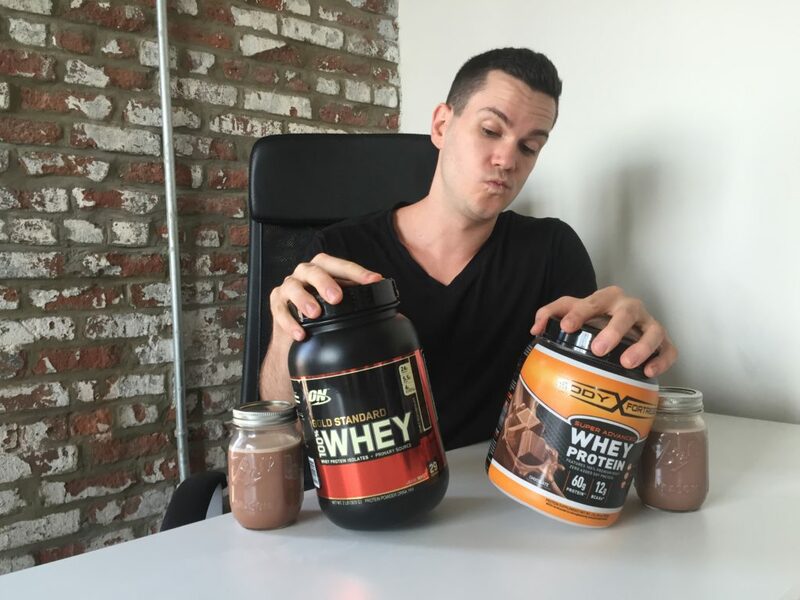 The first ingredient is the usually cheaper whey concentrate, which is one reason it’s higher in carbs and fat. It also contains maltodextrin, a sweetener made from corn (which would also add to the carb count) and cellulose gum, a thickener and stabilizer. It’s notable that even though it contains lactose and gum, there are no enzymes to minimize potential digestive discomfort, which may turn away some consumers. 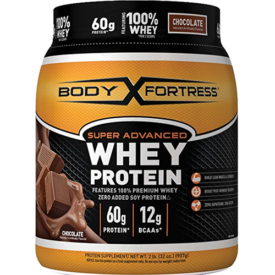 It’s also worth noting that Body Fortress has a “super recovery blend” with 1.5 grams each of creatine, taurine, and l-glutamine. However, glutamine is likely a fairly ineffective muscle building supplement (most of it gets stored in the gut) and creatine is usually administered in doses of at least three to five grams. But 1.5 grams of taurine may help reduce muscle cramps, so that’s not a bad addition. So, Body Fortress has some taurine but overall it seems to have lower quality ingredients compared to Gold Standard. Two pounds costs $30 and provides 29 servings, which comes out to $1.03 per serving or 4.3 cents per gram of protein. Two pounds also costs $30, but the serving size is over fifty percent larger. That means that two pounds just provides 18 servings at $1.66 per scoop or 5.5 cents per gram of protein. Gold Standard is the clear winner, here. Gold Standard has dozens of different flavors available, which is a plus. I tried the Double Rich Chocolate flavor, which is pleasant and mild; great in milk, but pretty bland with water. There are five flavors available: chocolate, vanilla, strawberry, chocolate peanut butter, and cookies n creme. I only tried the chocolate flavor, and it’s notably more cocoa-y compared to Gold Standard, closer to dark chocolate than milk chocolate. However, I wouldn’t call it enjoyable. It’s more like the earthy, bitter type of cocoa flavor, and what’s more is it sticks to the inside of your mouth when you drink it. I didn’t like it. To me, this wasn’t a very close contest. I thought Gold Standard was cheaper, tastier, has more protein per gram, and is more likely to digest well.